Become your favorite Skylanders Giants hero and let your pistol do the talking with Trigger Happy’s Dart Blaster by Mega! 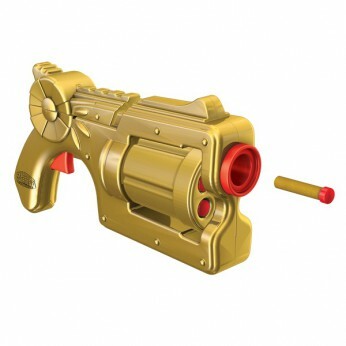 Wag your tongue wildly and defend Skylands from the forces of Kaos with this detailed replica of Trigger Happys Gold Coin Shooter. A six-shot barrel, six darts and a loose trigger finger will give evil minions the message that messing with everyones favorite cackling gunslinger is no laughing matter! Become your favorite character! Iconic weapon of Trigger Happy; Multi-chamber dart launcher; Includes six darts; One supplied; For ages 8 years and over; Manufacturer’s lifetime guarantee; EAN: 065541954908. WARNING(S): Not suitable for children under 3 years old. This toy costs approximately £14.99 (for the latest and best prices make sure you check our retailer list for the Mega Bloks Skylanders Trigger Happy’s Dart Blaster above). In our review of Mega Bloks Skylanders Trigger Happy’s Dart Blaster we classed it as being suitable for ages 8 years, 9 years, over 10 years but recommend you check the manufacturer specific advice before purchasing.